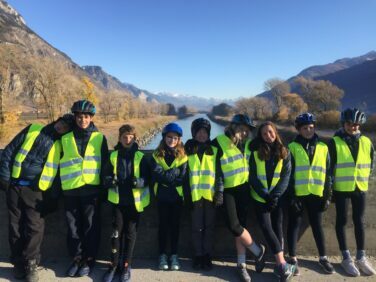 Congratulations to a group of 15 members of year 7 and 8 students who this weekend began an adventure to cycle part of the Swiss National Cycle Route One. In its entirety, this magical 350km route follows the Rhone River along the valley floor to Lac Léman. 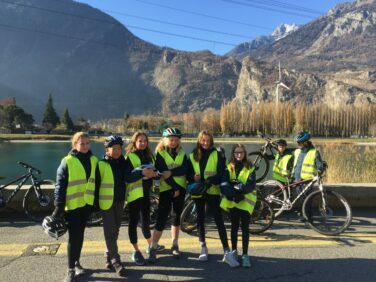 The students began the adventure by travelling by train with their bikes to the beautiful town of Sion. With a sigh of relief the team quickly left the traffic and the town for the beautiful cycle route along the river to pass through parks and vineyards with magnificent mountain views above. The students worked in small groups looking after each other and waiting at key points along the way. The kilometres passed quickly but everyone was relieved to arrive at the overnight accommodation near Saillon, happy to rest their tired legs and sore bottoms! Sunday morning proved a challenging start with freezing temperatures but frequent stops combined with star jumps and relay races soon warmed the team and the sun was reached as they passed Martigny to head north towards home and the lake. The team finished here and hope to complete the final section of the ride in the summer term. Mrs Thomas is Aiglon's Head of Junior Expeditions and Activity Coordinator. She is one of just six British female international mountain guides. Before joining Aiglon she spent 18 years working at the National Mountain Centre, Plas y Brenin, in Wales becoming its first female Chief Instructor. Today, she enjoys the intricacy of rock climbing and training her students in this passion.